Laser sheets are made from pressure sensitive materials and produce high-quality text and graphics. Hospitals, clinics, physicians, pharmacies and more use laser sheets throughout their operations. Laser sheets are used in a wide variety of applications including quality control labels, pharmacy labels, patient wristbands and identification, visitor identification, receipts and more. They are perfect for printing both 1D and 2D barcodes. 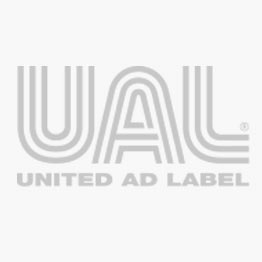 United Ad Label produces laser sheets in dozens of sizes and colors to fit almost any need. Our vinyl material resists moisture and is perfect for labeling items that go in the refrigerator or freezer. Plus, the smudge-proof materials don’t jam or melt in your laser printer. UAL laser sheets are in stock and available for immediate shipment. 3/4" Fl. Green Laser Sheet, 4" x 9 1/2"
3/4" Fl. Pink Laser Sheet, 4" x 9"
3/4" Fl. Yellow Laser Sheet, 4" x 9"
High Speed Laser Printer Label, 2-3/8" x 1-1/16"
High Speed Laser Printer Label, 2-5/6" x 1"
High Speed Laser Printer Label, 4-1/4" x 1-1/16"
High Speed Laser Printer Label, 4-1/4" x 2-3/4"
High Speed Laser Printer Label, 4-1/4" x 5-1/2"
High Speed Laser Printer Label, 8-1/2" x 11"
Laser Printer Label, 1" x 4"
Laser Printer Label, 1-1/2" x 1"